It is written in Isaiah chapter 42, Behold My Servant, whom I uphold; Mine elect, in whom My soul delighteth; I have put My Spirit upon him: He shall bring forth judgment to the Gentiles. 2 He shall not cry, nor lift up, nor cause His voice to be heard in the street. 3 A bruised reed shall He not break, and the smoking flax shall He not quench: He shall bring forth judgment unto truth. 4 He shall not fail nor be discouraged, till He have set judgment in the earth: and the isles shall wait for His law. Thus far the text. Let us pray: O Lord, No nation, including Israel, is Your Servant. No individual within any nation is Your Servant. Your Servant is Jesus born of the virgin on Christmas morning. Grant us You Holy Spirit to hear of this Christmas according to Your prophet Isaiah; in the name of Jesus. Amen. On the one hand, a servant labors for his master. Here the master has a burden to carry but he places that burden on his servants, employees, slaves for them to carry. The master receives the benefit of their work. This is a common understanding of servant even in religion. The people work for the god. The god receives the benefit of the people’s work. The people then remain in good standing with that god. The Lord’s Servant is entirely different. The Lord’s Servant is God. This true God does not burden His people. Rather, His people are to place their burdens upon the Lord’s Servant who is God. God will work to carry the burdens for the people. The people benefit. Isaiah, when he is speaking of the Servant of the Lord, is speaking of the coming Jesus. 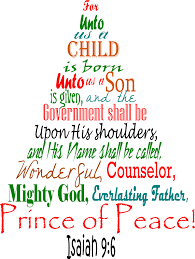 But to grasp Christmas according to Isaiah we need to step back to what was already written and in the hands of Isaiah. The Book of Exodus. Exodus records the battle of the servants. On the one hand, Pharaoh was a god-like figure in Egypt. His most important duty as the god of Egypt was to hold a religious ceremony every morning and evening to control the rising and the setting of the sun. Pharaoh’s servants/slaves were all the people in Egypt, even the Hebrews served at the pleasure of Pharaoh. On the other hand, Moses was not a god but spoke the Word of the Lord’s Servant to Pharaoh. The message to Pharaoh was, “Let My people go.” The Lord’s Servant wanted His people to conduct a religious ceremony at Mt. Sinai every morning and evening too. Except, the purpose of the religious ceremony was not to control the rising or setting of the sun or to control anything else in creation. The ceremony was a means for the people to cast their burdens on the Lord’s Servant. The work of the Lord’s Servant was to carry away the burdens of the people. Jesus is the Lord’s Servant at Mt. Sinai. Jesus is serving His people. Jesus is carrying the burden of sin for the people. Jesus is the Servant of the Lord. The Divine Service is the religious ceremony that God gave at Mt. Sinai. The Divine Service was first enacted as written in Leviticus chapter 9. The Divine Service is the Word and Sacraments given as a means for the people to unburden themselves of sin and iniquity. Jesus is the Servant of the Lord in Moses’ Day. Jesus is the Servant of the Lord in Isaiah’s Day. Isaiah is promising that the Servant of the Lord who let His people out of Egypt is the Servant of the Lord who will be born of a virgin on Christmas morning. Our Father delights in Jesus THE Servant of the Lord. The Holy Spirit is upon Jesus THE Servant of the Lord. Jesus, THE Servant of the Lord, will carry the sins of Israel and all nations upon His shoulders and atone for the sins of many by His death. Jesus serves you buy dying the death you deserve so that you may burden Him with you sins, and iniquities, and debts to your heavenly Father. Now the Father delights in You because you unburden yourselves upon Jesus by repentance and faith in Jesus the bearer of your sin. Jesus did not cry rather He serves you to save you. Jesus did not refuse to be lifted up on the cross rather He serves you to save you. This is Christmas according to Isaiah - Jesus is the Servant of the Lord. He does not serve you as if you were His master telling Him what to do. Jesus is not your slave. Rather, Jesus serves you according to His Father’s will. And what is our Father’s good and gracious will? It is this: that Jesus breaks and hinders every evil and purpose of the devil, the world, and our sinful nature, which do not want us to hallow God’s name or let His kingdom come; and when He strengthens and keeps us firm in His Word and faith until we die. This is His good and gracious will. (Small Catechism). Your faith may be weak this Advent season. But hear this according to Isaiah: 3 A bruised reed shall Jesus not break, and the smoking flax shall Jesus not quench … Jesus shall not fail nor be discouraged. And 700 years after Isaiah prophesied, the last prophet - John the Baptist - solemnly declared, Behold the Lamb of God, who carries away the burden of your sin (Jn. 1:29 KJV); in the name of the Father of the Son of the Holy Spirit. Amen.